The Upper Delaware River dodged a bullet this August when heavy rains and flooding washed out a railroad culvert, and a 63-car train carrying an assortment of waste materials, some of it toxic, derailed near Deposit, NY. 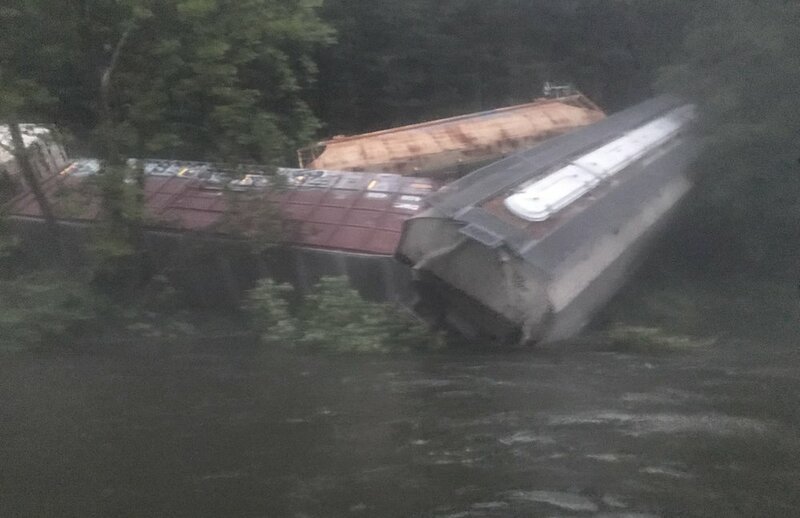 Two rail cars plunged into the West Branch of the Delaware, home to one of the East Coast’s most prolific wild trout fisheries. An estimated 4,000 gallons of diesel fuel spilled from the train’s punctured gas tanks into the river, leading to widespread reports of strong fuel odors and visible slicks for 30 miles downstream. It was a relief that rail cars carrying the most toxic cargo—sulfuric acid, soil contaminated with low-level radioactive elements—remained upright, intact, and out of the water. But that was cold comfort amid alarming reports of waterfowl soaked in fuel and wild trout rising through a sheen of gasoline. While responsibility for this dangerous infrastructure failure is under investigation, and it’s too soon to assess the long-term damage to the river, one thing is clear: Governor Andrew Cuomo and the state agencies he directs need to pay attention. Often overshadowed in a state with a wealth of water resources, from the Great Lakes to the Hudson River to the Long Island Sound, the Upper Delaware is headwaters of an ecologically and economically significant river system that has made indelible contributions to the state’s social and cultural fabric. That’s why the state must commit itself to the work of restoring and improving the Delaware River and its related infrastructure, and maximizing the benefits the river provides to its communities. New York has taken steps in this direction. Alongside Pennsylvania, New York recently launched an unprecedented joint investigation to better understand the ecological complexities of the fishery. Last year, the state helped to craft a flow management plan that attempts to protect the coldwater ecosystem from erratic river levels and high temperatures. These are commendable efforts, but New York can do more. This is not just about taking care of a river, and a fishery, that can be a huge economic driver for a rural area. It’s also about mitigating flood hazards for cash-strapped municipalities already stretched by high-water events of the sort that led to this month’s derailment. It’s about creating infrastructure jobs for local contractors, and supporting the hotels, restaurants, gas stations, outfitters, and other businesses that depend on the outdoor economy. It’s about protecting a pristine drinking water source for New York City’s millions. Governor Cuomo can demonstrate his support for this river and this region in two immediate ways. First, he can dedicate Environmental Protection Fund resources in his next state budget to support flood mitigation, stream restoration, and recreational access projects in the Upper Delaware. And second, Cuomo can respond to a growing chorus of citizens calling for the governors of the four Delaware River Basin states to convene a summit and commit to meaningful, coordinated interstate action in support of protecting the watershed. If Cuomo takes these steps, the governor would join a broad array of local, state, and national partners working to restore this critical watershed. In towns and villages below the New York City reservoirs, officials have worked with conservation partners such as our organizations to develop regional watershed restoration plans, and are dedicating resources to local restoration projects. This type of restoration can provide high-paying family wage jobs in multiple rural communities. At a watershed level, the William Penn Foundation is investing millions of dollars over a decade to restore the Delaware River Basin. And in Washington, Congress has finally recognized the importance of the watershed by establishing a Delaware River Basin Restoration Program to coordinate and fund on-the-ground work to improve habitat, reduce flood risks, increase public recreational access, and create local jobs. But multi-state programs like these typically require significant local funding to match their grants, funding that primarily comes from the state. It’s time for Governor Cuomo to throw New York’s weight behind this watershed-wide effort. New York needs to demonstrate to the local communities and millions of others who use and depend on the Upper Delaware that it recognizes the value of this river by investing more of its attention and resources. This month’s scare on the West Branch is a wake-up call. Even after the railroad is repaired and the damaged banks are restored, the real work remains.